BACKGROUND: Total gastrectomy is the standard therapy for resectable gastric cancer, including cardia cancer. A number of cardia cancers are invasive to esophagus, which requires extensive resection of esophagus. In some cases, division of esophagus should be placed in thorax so as to secure margin of tumor. Division of esophagus and esophago-jejunostomy in Roux-en-Y anastomosis is a critical procedure in total gastrectomy. The more proximal the site of esophagus division is, the more difficult it is to perform the procedures successfully under the historical open laparotomy. Here, we demonstrate that under laparoscopic total gastrectomy those procedures are much more easily completed. 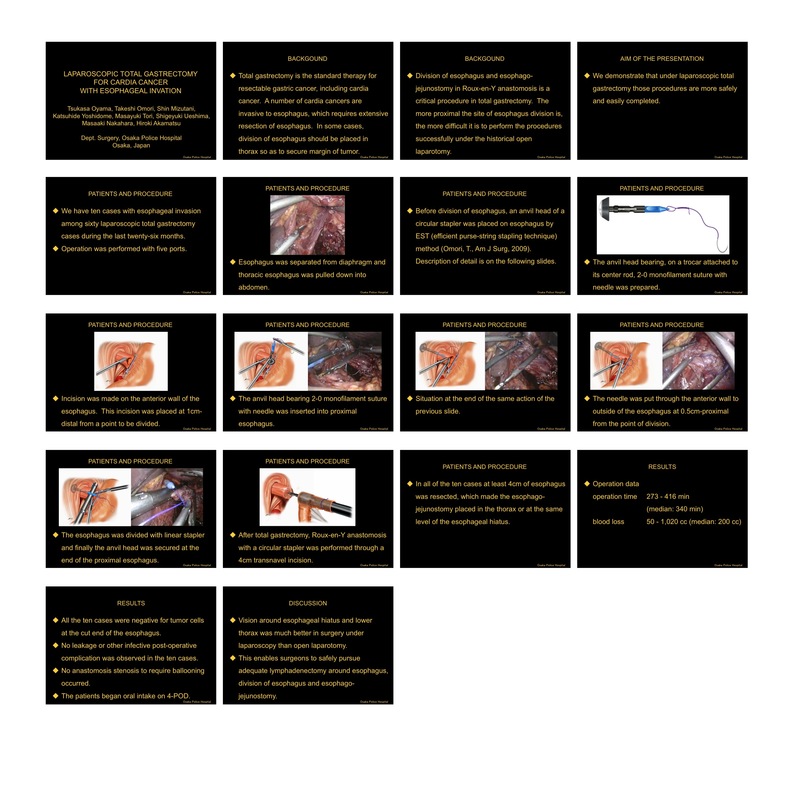 PATIENTS AND PROCEDURE: Among thirty-five laparoscopic total gastrectomy cases during the last eighteen months, we have six cases with esophageal invasion. Operation was performed with five ports. Esophagus was separated from diaphragm and thoracic esophagus was pulled down into abdomen. Before division of esophagus, an anvil head of a circular stapler was placed on esophagus by EST (efficient purse-string stapling technique) method (Omori, T., Am J Surg, in press). Briefly, incision was made on the anterior wall of the esophagus. This incision was placed at 1cm-distal from a point to be divided. The anvil head bearing, on a trocar attached to its center rod, 2-0 monofilament suture with needle was inserted into proximal esophagus. The needle was put through the anterior wall to outside of the esophagus at 0.5cm-proximal from the point of division. The esophagus was divided with linear stapler and finally the anvil head was secured at the end of the proximal esophagus. After total gastrectomy, the resected stomach was removed and Roux-en-Y anastomosis with a circular stapler was performed through a 4cm transrectal laparotomy. In all of the cases at least 4cm of esophagus was resected, which made the esophago-jejunostomy placed at the same level of the esophageal hiatus or in the thorax. RESULTS: No leakage or other infective post-operative complication was observed in the six cases. No anastomosis stenosis requiring ballooning occurred. The patients began oral intake on 4-POD. Discussion: Vision around esophageal hiatus and lower thorax was much better in surgery under laparoscopy than open laparotomy. This enables surgeons to safely pursue adequate lymphadenectomy around esophagus, division of esophagus and esophago-jejunostomy.